Arequipa located in the Southern Coastal region of Peru and is part of the "Southern Peru Tourist Corridor". Together with Nazca, Puno, and Cusco, this area attracts many visitors. Arequipa is different because it is an example of the Spanish and mestizo culture that developed in Peru. This city has no Inca artifacts or ruins. Many students choose to study Spanish in this city because it has nice weather and is a great place to base yourself. There are several good language programs found here. Arequipa has some very good and affordable accommodation options. Whether you're a student, solo traveller, couple or traveling with a group, you're sure to find a hostel or guesthouse that meets your needs. 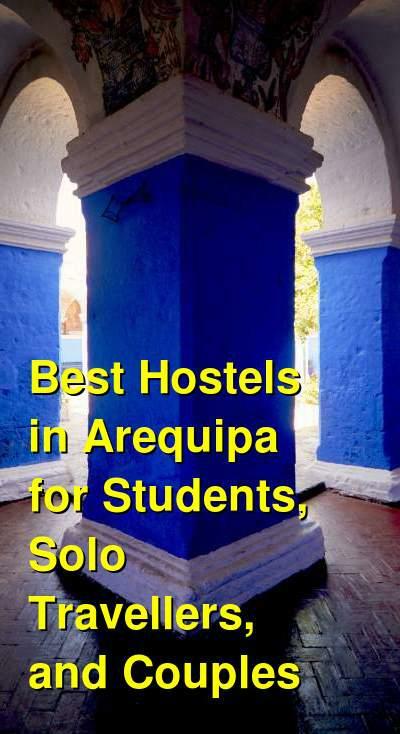 How much do hostels in Arequipa cost? Le Foyer Hostel is a favorite hostel for budget travelers to Arequipa. It's recommended by several guidebooks and has been around for years. The hostel is located two blocks from the main square and is in a famous and beautiful part of the city. It's also steps from Santa Catalina Monastery. The hostel's staff are friendly and helpful. They're available 24 hours a day and can recommend any number of activities, restaurants, or tours. They can also help you arrange trips such as trekking at Colca Canyon, rafting, and more. The hostel has the standard amenities including wi-fi, a nice outdoor terrace, a barbecue, plasma television, a book exchange, movies, and board games. Twin, double, triple, and quad private rooms are available as are four bed dorms. Econunay is another good hostel with a lot to offer visitors. It's walking distance to many restaurants, museums, and night life activities. There are also several great amenities in the hostel including board games and a large common area. The rooftop also offers a nice view of the city. It's a nice setting where you can meet other travelers from around the world, but it's also quiet and you can be assured a good night's sleep. The hostel does not allow outside alcohol. The hostel has large rooms that are bright and colorful. Double and twin private rooms are available as are five and eight bed dorms. The staff at the hostel are friendly and helpful as well. They can answer any questions you may have or make any restaurant recommendations. A family run hostel that is good for solo travellers, couples, and small groups. Friendly AQP is a family run hostel that is located about four blacks from Plaza de Armas (the main square). It's located in a nice home in the quiet residential neighborhood of Vallecito. This is a safe area with popular routes to the main tourist attractions. Also nearby is a grocery store, restaurants, banks, and shops. The hostel has many great amenities for guests including a free breakfast, a full shared kitchen, a large common area, a television, dvds, a pool table, ping pong table, and more. There's a large garden where you can relax outside on hammocks or at a table. There's also a terrace that offers views of Misti and Chachani Volcanoes. The in-house travel agency can help you arrange group trips to nearby sights such as Colca Canyon or the volcanoes. Twin, double, and triple private rooms are available as are four, six, and eight bed dorms. Marlon's House is located in old San Lazaro Barrio. 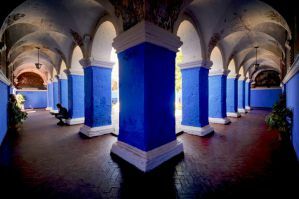 It's a few blocks from San Francisco Plaza and is three blocks from the main square. It's also close to restaurants, bars, pubs, museums, and grocery stores. The large city market is just around the corner. The hostel is a friendly and welcoming place to stay with clean rooms and a nice courtyard. There's also a rooftop terrace where you can sip tea and enjoy the view. The staff can help you with any questions you may have and they can help organize tours to any nearby sights and attractions. Popular options include jungle treks, city tours, and river rafting. The hostel has a wide range of rooms available to choose from so regardless of your budget or travel style, you're sure to find something you like. There are singles, twins, doubles, triples, and quads, as well as five bed dorms. Standard and deluxe rooms are available as well with either shared or ensuite bathrooms.